Start with a square and fold the bottom right corner to the top left. Unfold. 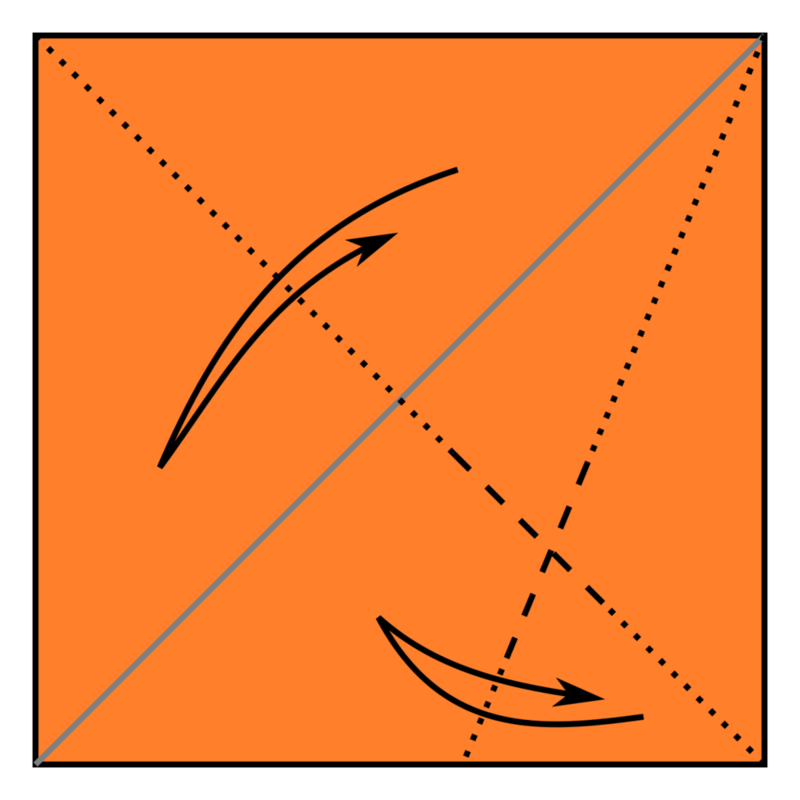 Fold the other diagonal and then also the right side to meet the first crease, but only crease in the place where these intersect. Turn over so the paper looks as shown and then fold the bottom corner to meet the crease intersection made in step 2. The result. Turn over the unit. Fold down the top point along the existing fold made in step 1. Fold the bottom point (that was the top moments ago) up to meet the layer behind. Fold the right side of the front triangle down to the bottom of the triangle. The result. Turn over and repeat step 7. Hold the peak behind and pull the front peak down until the paper is almost completely unfolded. Fold the marked points to meet each other and unfold. 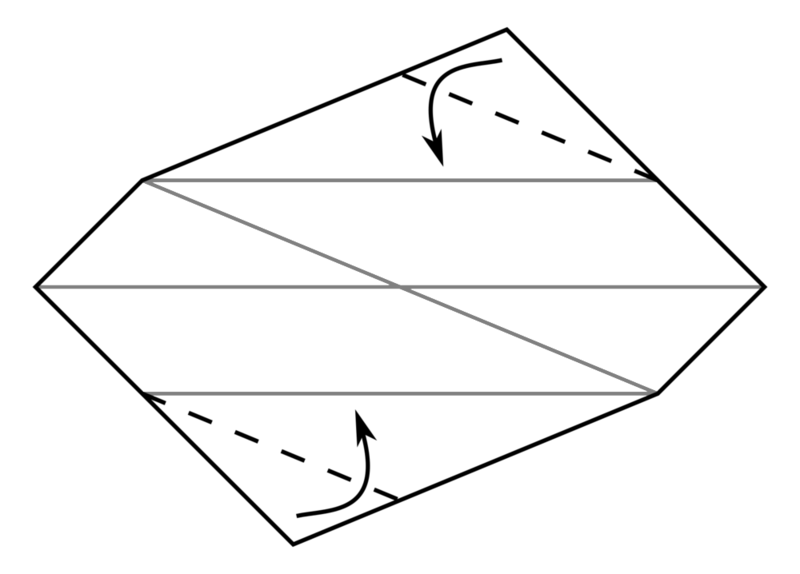 Fold in the small triangles shown so that the edge meets the horizontal folds. Fold in along the creases made in steps 3 and 6. Refold the diagonal made in step 10 and rotate the paper so this fold is horizontal. Make a fold by aligning the points shown. Fold down the top point by aligning the top edge with the right side. Then unfold. Make a smaller fold which meets the crease made in the last step and unfold. Repeat steps 14-17 on the other side to complete one unit. 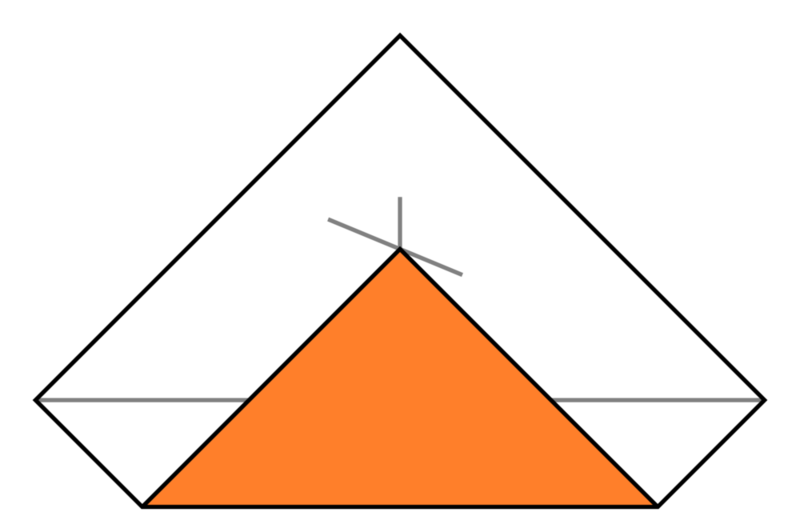 To assemble two units bring the orange highlighted edges together with the left unit around the right. Mountain fold the small flap (step 16) into the pocket to lock the units together. Continue connecting units to create the 30 piece model. At each vertex you should connect 3 units to form a mountain and form 5 unit rings giving vaguely pentagonal holes.